My personal RV search experience. My personal RV search took me to California! From Massachusetts! I know, that doesn't sound so frugal. But in the long run it was. I'm getting ahead of myself, though. Class B vans seem to be uncommon in New England. 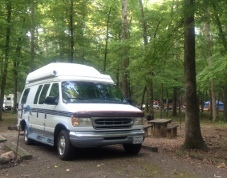 My online used RV search took me to a dealer in Vermont for a Roadtrek that turned out not to have a generator, a private seller in Virginia where the vehicle was already sold and another dealer in Georgia where a response just never came. I assumed it was sold as well. That seemed to be the case with the models that met most of my needs in my price range. I missed out on an Airstream in upstate NY to a buyer who was at the bank negotiating a loan when I called. Got the picture? Used RVs of the Class B variety are rare in the Northeast and yet, ironically, in demand. I just had to persevere. My List of Wants and Needs . . . It was Friday afternoon of Memorial Day weekend and a 1997 Coach House 192 TB van in Inland Empire CA was just posted on FindAnyRV.com. I called for more info and pics than the site had provided. The owner told me he'd just put the listing up on Ebay that afternoon and due to some difficulty the ad was to repost on Craigslist in the morning. He hadn't put it on FindAnyRV.com. Oddly enough my search criteria on Ebay took some doing before bringing up the classified ad and the rest of the pictures. But my two month effort located a van that had it all . . . a generator, inverter, built in coffee maker, TV/DVD/CD player and speakers, twin beds that convert to a king, a shower and all the basics. It was on a Ford ¾ ton Econoline chassis which had come recommended by a longtime owner and reseller of Class B motorhomes who had been generous with his advice. And it was in my price range of up to $15,000. How My RV Search Came To A Happy Ending. Since I had lots of frequent flyer miles to use up this year, I proposed flying out and if it was all the owner claimed it to be, then buy it from him and drive it home. I'd dive right in and learn the ropes. Needless to say, he was incredulous. But the pictures indicated it was in good shape and the owner was very forthcoming with so much pertinent information, I could tell he was a man of integrity. His concern was that I would not buy it and he'd loose the very busy holiday weekend up at Big Bear Lake to sell it if I passed on it. It was not so clear to him that I was a serious RV searcher intent on buying his motorhome if it was as he had led me to believe. I could only reassure him by agreeing to fly out that Sunday on a one way ticket and that I'd bring cash. 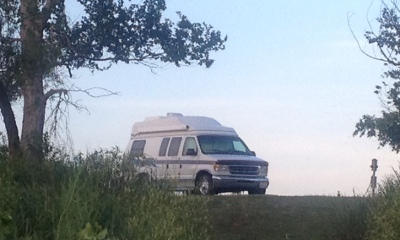 He and his wife offered to pick me up at the airport bringing my RV search to a satisfactory conclusion. I bought the camper van for a little less than his asking price and drove it home to Massachusetts over the course of the next 3 weeks. And this trip paid many dividends and became a mini RV Bootcamp for me.